Our mission was to travel the full extent of the Sprengisandur road. As I prepared for my journey from the comfort and safety of Reykjavík, I made a point of asking some local Icelanders about Sprengisandur. The above is some of what these locals said to me. Still, many others had never even heard of our destination (let alone been there). Guys, I’m not gonna lie: I was a little freaked out. Needless to say, I had some trouble sleeping the night before we were set to depart. When you think about Iceland, what do you think about? Probably green mountains and a beautiful, rugged coastline, right? 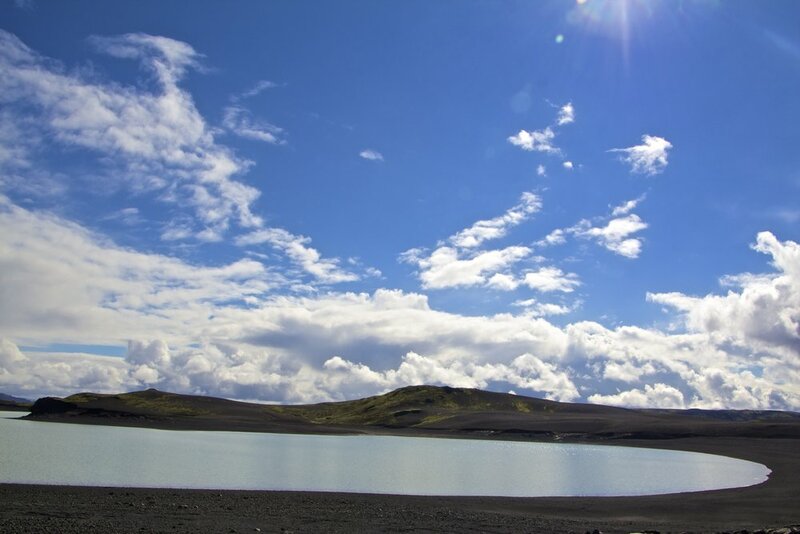 Well that's just one piece of the geothermal puzzle that is Iceland. Iceland's interior is a very different place. It's a vast, inhospitable, volcanic desert. And in this enormous highland desert, conditions are punishing, and water is scarce (unless it's in the form of a glacier). It's basically Mordor. There are only 3 roads that traverse this vast desert: Kjölur, Kaldidalur, and Sprengisandur. These are the same 3 roads that traversed the interior back in the olden days, during the time when Iceland's famous Sagas were being written. Of these 3 roads, taking the Sprengisandur route is far and away the longest, and most difficult journey to take across the interior. To be perfectly honest, when I go to a new place, I often find myself searching for the "craziest thing" that I can do there. For Iceland, Sprengisandur was the answer to that question. Its notoriety dates back to the early days of Iceland. In Icelandic folklore, this place was home to giants, trolls, ghosts, and all manner of other threatening fairy tale creatures. On top of that, it was said that dangerous outlaws had fled to Sprengisandur, never to be seen again. Eventually, Kjölur, Kaldidalur, and Sprengisandur were all abandoned, and they remained abandoned for hundreds of years. However, in recent years, people have begun to use them again. Today highland roads such as these are classified as "F" roads. The Sprengisandur road (F-26) is impassable for most of the year due to heavy snow and dangerous flooding, but during the summer, the voyage becomes a possibility. 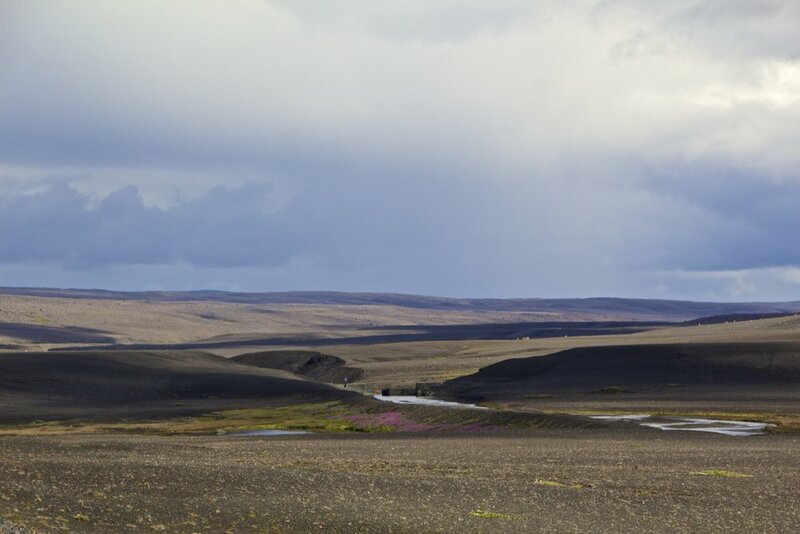 Early Icelanders were so scared of this road that, if they were obligated to travel on it, they would often force their horses to sprint until they died of exhaustion. Meanwhile, many other animals would also wander into this desert and die due to lack of water. As a result, the road gained a reputation of being littered with the bodies of dead animals. Combined with ominous folklore and tales of outlaws, these omens of death made Sprengisandur an object of fear and superstition among Icelanders. Even the name sounds scary, doesn't it? It really is like Mordor. 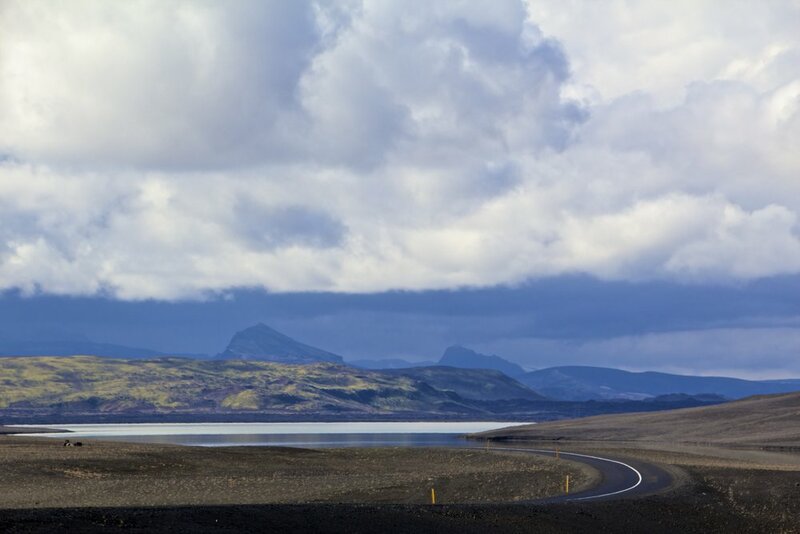 The road through Sprengisandur goes between two of Iceland's glaciers: Hofsjökull and Vatnajökull. Giants and trolls aside, the biggest actual danger in making the journey across Sprengisandur is crossing unbridged rivers created by glacial run-off. Every year cars are swept away in these rivers. People die. But I guess you gotta die some time, right? 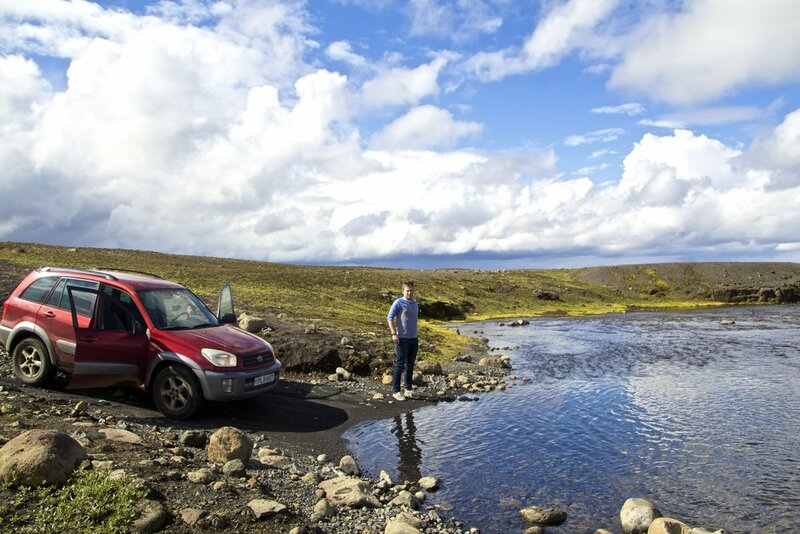 The Sprengisandur road would be 152 miles (244 km) of the roughest roads Iceland has to offer. By our estimates, the best-case scenario was that it was going to take us 8 hours to get from where the pavement ended in the south to where it began again in the north, on the other side of Sprengisandur. That is, assuming we even made it all the way across. If our path was blocked by a river too wide or too deep, we would have to turn back. In crossing Sprengisandur, you will not see a gas station for 149 miles (240 km), so we took care to stock up on gas, just in case. We filled up 5 spare fuel cans in a gas station just outside of Reykjavík as we were leaving. But just in case our fuel provisions weren't enough, we stocked up on snacks and bottled water as well. From there, we were off, through misty Icelandic landscape. Steam rose from the earth on the side of the road as we flew through the countryside. Eventually, after nearly 2 hours of driving, we came to the edge of the world, where grass met gravel. And when we got to the edge of the world, there was a lodge, a gas station, and a small restaurant that served only waffles. We filled up our gas tank one last time, double-checked the air pressure in our tires, and grabbed a couple cups of coffee from the restaurant. Still nervous about the river-crossings in our future, I asked the guy working at the desk of the lodge for some words of wisdom. He turned out to be a recent transplant to Iceland from the Czech Republic, so he didn't have much to offer in the way of wisdom. However, it just so happened that a Sprengisandur ranger was on the way to this lodge. I decided to wait for them. ...until, eventually, the pavement ended. The southern stretches of the Sprengisandur road were rough. They were so rough that we were barely going 20 mph at most of the time. We weren't sure how long our car was going to hold up if these conditions persisted. Driving on these roads without a 4x4 isn't just dangerous, it might actually be illegal. We had paid a lot of extra money to rent the cheapest, used 4x4 we could find (a Toyota RAV4 from SAD Cars), but we still felt uncertain about making it all the way to the north of Iceland. The problem was that whatever massive machine had paved this road had left enormous grooves behind it, which stretched across the road horizontally. It was like our car was perpetually going over giant, sharp speed-bumps. As time passed though, we started to get used to it. Out the window, a vast gravely desert stretched onward towards the horizon. Weather changes fast in Iceland, and from our vantage point way up in these barren highlands, we could see storm clouds in the distance, working their way across far away places. Here in Sprengisandur though, there were clear skies. But how long our good weather would hold out was anyone's guess. Clouds hung low on the horizon. There hadn't been any instances of river crossings yet, but we would often come to low points in the road where enormous amounts of water had accumulated. Driving across them, we were tenuous at first, but we soon began to realize that our little 4x4 was a lot hardier than we thought. We sped through these small ponds like it was nothing! Things were going pretty well... until we turned a corner to find a full-on river flowing across the road. In my preparations for this trip, I had been told that glacial rivers were not an absolute certainty, so I had been crossing my fingers that we would get lucky and never have to cross one at all. But I've never been a very lucky guy. To buy river crossing insurance from a rental car company would have cost almost $60.00 per day (you do the math), so I had decided to risk it. I'm not made of money. But this meant that if we misjudged the depth of a river and we were swept away, I'd be liable for the full value of our vehicle (that is, if I even lived to tell the tale). This first glacial river was wide, and looked to be relatively deep in the middle. Sitting in my rented car, I was worried. So what could I do? How could we cross the river without taking an enormous risk? Well, I did what any good big brother would do: I made my little brother walk across it beforehand in order to see how deep it was. He grumbled his way across the icy water in his underwear (which was hilarious by the way), and we were able to ensure that the river was, indeed, crossable. So we pushed onward! Soon afterward, a large volcano appeared on the horizon. It's slopes were studded with craters, like the surface of the moon. This marked the beginning of Vatnajökulsþjóðgarður National Park. No, I have no idea how to pronounce it. But in almost the exact middle of the Sprengisandur, the infamous F-26 road passes through the corner of Vatnajökulsþjóðgarður National Park. Vatnajökulsþjóðgarður National Park is an enormous wilderness area in Southeastern Iceland which centers around the Vatnajökull Glacier. And to our west we could see Langjökull Glacier off in the distance. This part of Sprengisandur is literally sandwiched between these two glaciers. We immediately knew when we had arrived in Vatnajökulsþjóðgarður because suddenly the black moonscape around us was ablaze with color. The ground around us was neon green and yellow. Literally neon. Seriously, it was, like, retardedly green. Ahead of us large, dark mountains protruded from the mossy plains. Driving through this arctic oasis, with the wastes to our left, and green glacial mountains to our right, I had the sense of being on the precipice of something huge. To look at our position on the map, we were passing through a pointy corner of Vatnajökulsþjóðgarður National Park, which is absolutely massive. 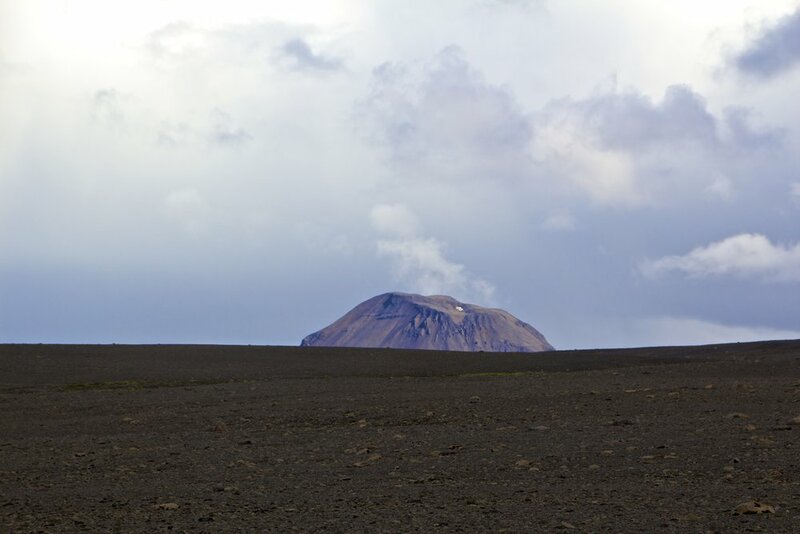 Sitting on the southeastern side of Iceland, this national park is the most volcanically volatile region in Iceland because it sits right on the "hotspot." Meanwhile, regions like the Westfjords (where we will soon be going) have long since lay dormant. Driving through this burst of color, it was only natural that we soon came upon water. Large glacial rivers, formed by run-off from Langjökull Glacier, had engulfed the road ahead of us. These rivers were much bigger than any we had previously encountered. I was nervous, so we decided to wait for another car to come along. It was not long before another vehicle appeared on the ridge behind us. It powered down towards the raging torrent in front of us, and without stopping, plowed right through the water. It looked as if the car was working hard, but it reached the far side of the river unscathed. So, with a shrug, we followed suit. This river turned out to be quite deep. Water splashed up over our hood and onto our windshield. It seemed as if our car was beginning to lift off the bottom of the river bed for a moment, when finally, our tires began pulling us upward on the far bank. When we got ourselves back up onto dry land, there was smoke coming out from underneath our hood. Not knowing what else to do, we continued onward and pushed through the 2nd, shallower river. On the other side, we stopped to give our poor car a rest, and took pictures of other vehicles as they braved the swift glacial currents. The cars pictured below were quite a bit bigger than our 4x4, but even they seemed to have some trouble getting through. Spoiler alert: this was the biggest, scariest river we encountered on our whole trip. Many other, smaller rivers would follow on the other side of Vatnajökulsþjóðgarður National Park, but we were professionals by that point. Being just below the arctic circle, few places in the world are being affected by global warming as strongly as Iceland. Every year, Iceland's many glacier's lose an average of 11 billion tons of water, and each retreat roughly the the distance of an olympic length pool! Yeah... not the most creative names. Icelandic is a language that looks like it would be really difficult because it's got so many absurdly long words, but in reality it's just a bunch of small, boring words smushed together. Pronunciation is borderline impossible though. At any rate, here are a few pictures that I took of each respective glacier at various points throughout our trip. Embarking through the 2nd half of Sprengisandur, we immediately came across a car with a flat tire. And when I say "car," I mean like a little Prius. Whoever had driven this little thing out here had been an absolute fool! However, as fellow humans, we felt obligated to stop and see if we could help. It turned out that help was already on the way, so there was nothing to worry about. We wouldn't have been able to remedy their TWO flat tires anyway. But guess what: not only was this couple from my home town, back in Ohio, the woman in this car had been a nurse in the hospital where I was born, during my birth! PRETTY SMALL WORLD! FINALLY, we flew over a rocky hill, and we saw green again. We had made it to Northern Iceland. The end of Sprengisandur and the beginning of Northern Iceland is marked by a waterfall called Aldeyjarfoss. It's a marvel of geology. We were tired but we could hear its roar all the way up on the road, so we parked, scrambled down a cliffside, and I snapped these pictures of it. From there, it was time to move on, into the greenery of the northern fjords; into the Iceland that we all know and love. Up next, we'd be making our way through the northern mountains and fjords to Iceland's 2nd largest city: Akureyri, where it's Christmas all the time.